PORT ALLEN, La. March 18, 2015: After a long off season, Team Aruba was anxious to get back on the track and tackle the 1320 feet of an IHRA Nitro Jam racing surface. State Capitol Raceway in Port Allen, La. 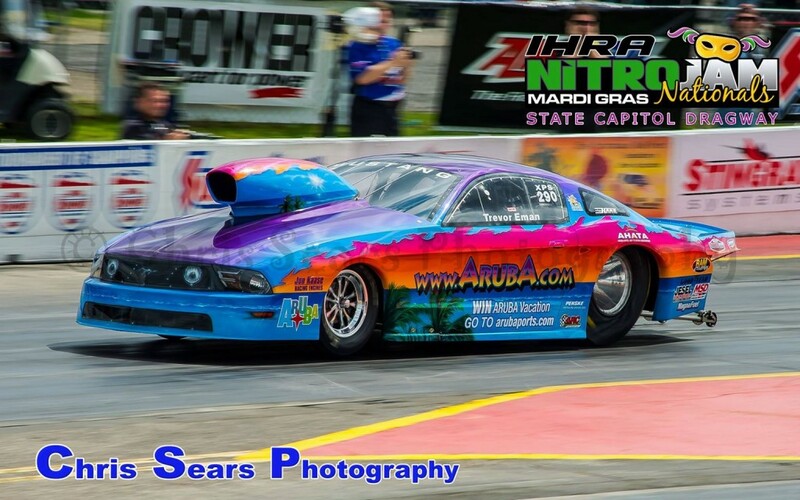 played host to the IHRA Mardi Gras Nationals this past weekend and was the stage for Team Aruba’s return to the restructured and renewed racing organization. Despite Mother Nature cancelling Friday’s test session, Team Aruba qualified for the elite eight car field with a 6.39 elapsed time at 222 MPH. Eman and team were then set to take on number one qualifier and former World Champion, John Montecalvo, in round one. Although Montecalvo was a very formidable opponent, the Aruba.com Mustang made easy work of Montecalvo’s bowtie entry, when Montecalvo was forced to abort the run. Eman posted his best elapsed time of the weekend, a 6.326. Rainy weather on Friday made for tricky track conditions on race day and in round two, this would prove to be Team Aruba’s nemesis. Eman encountered tire shake that forced him to let off the throttle, giving opponent J.R. Carr the semi final victory. “Rain took its toll on the racetrack and affected the schedule in such a way that we could not test nor qualify on Friday,” Eman explained. “However, the IHRA staff did a phenomenal job on the racetrack getting it ready for Saturday. We were certainly impressed in their accomplishment of getting not only the track ready for racing, but certainly even the entire event in the books with all the added difficulties they faced. It has been several years since we have raced quarter mile so pre race testing and additional qualifying runs would have been helpful, but we were able to get the Aruba.com Mustang qualified and past round one, which was a great accomplishment for our first race back on the quarter-mile. “Regardless of the rainy weather conditions that hindered our testing and qualifying, this was truly a great event,” Eman added. “Besides being able to race quarter mile again, the greatest aspect of the entire weekend was the treatment we received by the people. The people from State Capitol Raceway and all of the New Orleans area fans treated us especially well. The Mardi Gras-themed Nitro Jam brought much of that culture right to the track, providing great entertainment for fans and racers alike. In recent years the IHRA has placed greater emphasis on the fan experience at their events, a move that has proven beneficial to fans, racers and sponsors alike.